Students during lunch period at Ravenswood Elementary chow down on Doritos, nacho cheese and sunflower butter. The new nut-free policy means peanut butter isn’t allowed. It’s a typical day in the Ravenswood Elementary cafeteria on Chicago’s North Side. Middle schoolers catch up with friends, make jokes and chow down on a mishmosh of cafeteria food and brown bag lunches. “I have a Subway meatball sub,” one says. “I have homemade soup with some rice,” chirps another. “And I have some Doritos with peanut butter, I mean sunflower butter,” their friend adds, catching himself as he remembers the school’s new nut-free policy. 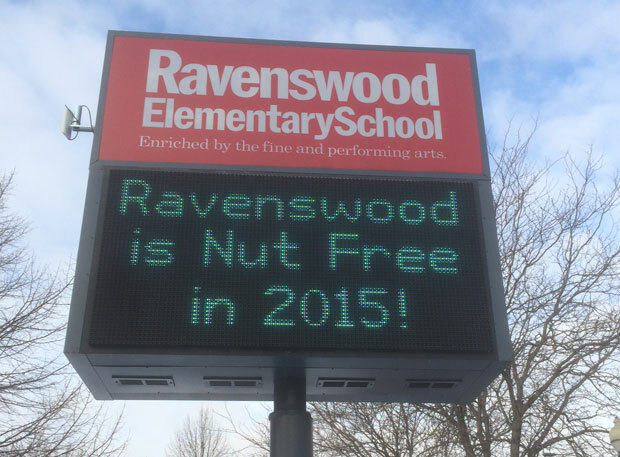 Starting in 2015, Ravenswood joined a small cadre of schools that have passed nut-free guidelines that go above and beyond the more common nut-free tables and nut-free menus. That means no PBJs, no nutty granola bars, and no Snickers. In recent decades childhood food allergies have skyrocketed from 1 in 50 American children in 1990 to 1 in 13 today. That works out to about two kids in every American classroom — and that number is growing. So how many schools are taking a hard stance against food allergies like Ravenswood? Chicago Public School officials say they don’t know. But the district does say it offers nut-free meals to about 200 schools (or roughly a third of the district). Most of them are located in more affluent areas or on the North Side. But those aren’t necessarily the schools with the greatest need. Research shows that potential food allergies are actually higher among minorities. One Children’s Memorial Hospital study showed that those with African ancestry have a higher-than-average nut sensitivity. Beverly Horne is the lead nurse in the south region of Chicago Public Schools. She oversees more than 100 schools on the South Side, but says that none have adopted the same kind of nut-free guidelines as Ravenswood. In order to be allowed medical accommodations, students need documentation along with a doctor’s diagnosis. But for many of the families she serves, Horne says, simply getting to the doctor is hard enough. She says nurses do what they can to fill in the gaps on the one to two days a week they can visit a particular school but it’s often not enough. Plus, she says, many parents don’t always know what to look for. In 2010 7th grader Catelyn Karlson died after eating peanut-tainted food that was brought to her Northwest Side school. Since then, CPS became the first large urban district to put epinephrine injectors (or EpiPen) in every school. There they can be used to treat anyone in anaphylactic shock — a severe allergic reaction that can stop a victim from breathing. Dr. Ruchi Gupta, a pediatric allergist at Lurie Children’s Hospital, helped lead the effort. In a report on its first year of progress, she noted that 38 students and staff were treated with the injectors. More than half of them didn’t even know they had a food allergy. This lack of knowledge worries Gupta, who says policy makers need to ask more questions. Minority students may be more vulnerable to food allergies, but Gupta says other factors contribute to how schools decide whether to implement nut-free policies. Most of these policies, she notes, are driven by parents in Local School Councils, which is exactly how Ravenswood ended up “nut-free” this year. Ravenswood principal Manaen says there was some push back as he worked to get his whole school community on board with the guidelines. But, it’s one thing to say you’re nut-free, it’s another to make it a reality. It’s not as if you can install nut detectors at the door. It is, however, one step toward making schools a little more safe — at least in some parts of the city.